Spring Cleaning: Let it Go! I have a confession. There are clothes in my closet that I have not worn in many, many years. I look at them most days and move through to the next article of clothing that I know I will want to wear. Having clothing that I do not wear can be an energy drain, like having a weight on my shoulders. 2) I do not like the style or I do not think I look good in that particular style. 3) They look old and worn. I know having clothing in my closet that I do not wear is not good for me. It reminds me of mistakes I made. It reminds me of wasted money. It reminds me of something I do not like. At this point in my life, you will not find in my closet clothing that does not fit me. I do not keep around clothing anymore that is too large or too small. I found the clothes that were too small reminded me that I was not the size I wanted to be or used to be. Keeping clothing from when I was larger remind me that I did not trust myself to remain the same weight. I would keep the clothing that was too small, because when I started my next diet, I would then be able to fit into them. I felt burdened by those clothes and ashamed that I had yet again gained weight. I have since learned the value of having clothing that fit me as I am right now. For me living in the reality of the present moment helps me to consider being a little better in the next moment. I know there are people who will say that keeping the clothing that is too small is motivation to lose weight. That has not been my experience. I found that keeping those clothes that are too small remind me that I have not been successful and it leads me to feel upset with myself. So now I am cleaning my closet and I am finding there are other clothes that feel like a burden to me (not too small or too large), because I know I have not worn them for ages. 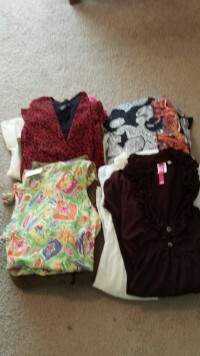 As I have gotten these clothes out of closet something interesting has happened; I am resistant to letting them go. I am unsure if I want to get rid of them. I think, maybe I will wear them soon or need them soon, which is exactly the thought I had with the too small clothes. I noticed there were emotions of guilt that I bought clothing that I really do not like. As I take this step to let go of what I do not want, I can begin to feel the freedom of keeping around me items that I like and feel good on me. 1) Shop in a more leisurely manner (no kids, no time table). 2) Buy clothing that makes me feel good, not what I think I should wear. 3) I will continue to buy clothing that fit me right now. 4) Let go of clothing that does not suit me. I am focused on moving forward in a positive manner. I have been talking to my clients lately the idea that positivity propels us forward and negativity propels us backwards. Since I want to move forward, I am inviting in a positive mindset which include not keeping items that I do not use (including clothing). Do you have a closet with clothing that you have not worn in over a year? Do you have clothing that you are waiting to wear when you lose weight? Consider getting rid of it and let it go! Let us know below that you are going to take a step to clean out your closet. Kim McLaughlin, MA is a licensed therapist and a Motivational Coach. She specializes in working with people who suffer from binge eating, emotional eating and eating disorders. She is a Certified Intuitive Eating Counselor. You can contact Kim at 916-847-8053 or email her at kimmclaughlinmft@gmail.com.